I posted back at the beginning of January about shirts for boys to wear for Valentine's Day. The choices in stores are usually limited and most of those choices are either not really appropriate for a nine year old or not something he would be caught dead wearing. But Extra Ordinary Bree saves the day with this very cool binary conversation heart shirt. 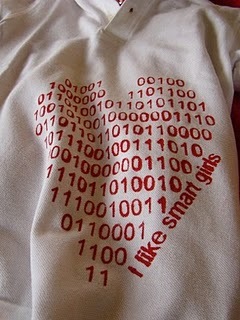 I won't even pretend that The Boy will want to wear a shirt that says I like smart girls (not this year anyways), but with the Binary to Text Conversion Tool you can come up with any phrase that you like. Find out what it says HERE and then head over to Extra Ordinary Bree and see her other binary shirts for Valentine's Day. P.S. These would make really cute valentine cards too! OMGosh....my son LOVES all thing binary! ;) So fun! That is fabulous, I love it! Oh dear lord, that is darling. Thanks for sharing my shirt!! I made the "I like smart girls" shirt for my 6 year old and told him it was a secret code that no one else understood and he was all ready to wear it until I put the text on the bottom of the shirt... now he completely refuses to touch it!